I ask you this even if I don't want to adopt a pigeon yet of course because I'm still taking care of my little Igo (that I hope will be free again) and I live in a house with 2 cotenants in a city. I would like to adopt in the future some pigeon that are in bad situations, like racing pigeons. 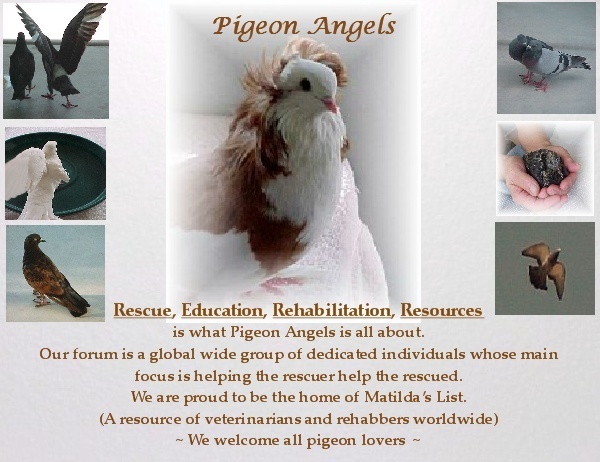 So my question is do you know any centre here in Italy where there are people caring of pigeons ? Here in my city there is a big centre where they breed racing pigeons... what do you do to save racing pigeons that are ending their carrier? I think the best approach is to contact the centre and tell them you want to adopt one as a pet. They should be able to get you one who isn't good for racing any more, either because of injury, age, or simply because they are not as fast as the rest, or to give you the contact of the nearest racing lofts. But it would be best to wait until you are ready to adopt! Me and my boyfriend want to have a little dovecot in our future house, it'll be funny ! It's a fantastic idea, and of course when that happens, we'll be asking for photos!